Monday: Core work while I waited for a 5pm meeting to begin. I changed into workout clothes, did my stuff in my classroom alone, then wiped down with baby wipes and put my work clothes back on. Success! I'm really pleased with how defined (for me) my arms are starting to look! (Forgive my TERRIBLE form in the bottom picture; this was near the end of my workout and I was tired!) Also, I can't get enough of the Free Love print from Skirt Sports. Tuesday: .66 mile repeats. This was an increase day: more mileage per repeat and I upped my reps with the dumbbells to 15 from 12. I felt so strong. The paces felt almost easy and my breathing was awesome - just tired in my legs. Elizabeth was exhausted and I was going to cut it to 5 but she made us finish the last repeat. We make a good team. 6 x .66 miles at the following paces: 8:50; 9:00; 9:00; 8:55; 8:45; 8:35. I keep telling Elizabeth we're aiming for 9:30s and then I keep holding us at sub-9s. Oops. Wednesday: We tried something new with dance workouts! Elizabeth and I did three 10-minute videos from Keaira LaShae on YouTube. This one was great! Wednesday is usually leg day but we were really tired from Tuesday, so we looked for something different for total-body and core. Thursday: I was supposed to rest on Thursday, and I told Elizabeth I couldn't wait to leave work and just do nothing. But the minute I got home, I didn't want to sit and do nothing. I wanted to move. So I convinced Elizabeth to come over and walk the golf course with me. We did ~1.9 miles at a leisurely pace and it was just what I needed. Friday: A brisk, moderate-effort run over the bridge. On the first ascent my quads were screaming, and they were fatigued the rest of the run, but I pushed through and we kept a really decent pace. 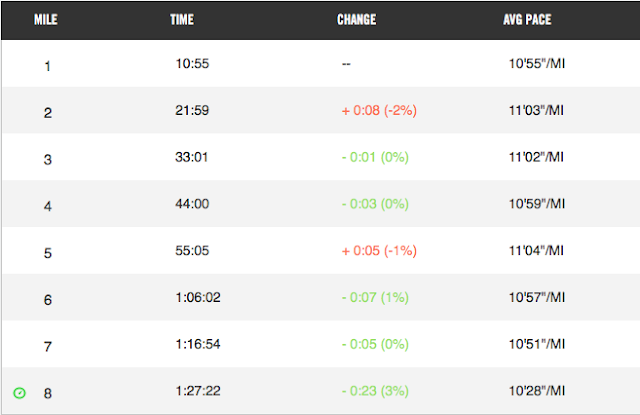 I was proud of myself at the end of this run, and it felt good to feel genuinely tired after an "easy" run. I celebrated this run with a reuben from Jason's Deli. The sauerkraut really hit the spot! Saturday: Rest. For real this time! I laid out on the lanai and did laundry and dishes; that was the extent of my heavy-lifting! Sunday: 8 miles with Elizabeth. This was actually a virtual 10k I was running, so I'll do a separate write-up on it this week, but the bottom line is that I felt awesome and my splits were crazily even. I could have done 10 if I'd felt so inclined. I haven't had such an effortless run in awhile, and it really boosted my confidence! Overall, this was another fantastic week! I'm really beginning to feel like I'm reaping the benefits of consistent speed work and cross-training; it's the best I've felt in awhile, honestly. Obviously all but one of my workouts this week were with a buddy; Elizabeth and I are "accountability partners" at work so we've been really taking advantage of that title and have been helping each other workout and eat healthfully. It's definitely keeping me on track, which is the whole point! I'm looking forward to another great week to kick off May! Do you truly rest on rest days, or do you do light exercise? Your arms look awesome! A week ago I held a workout with other teachers after school. It was nice just getting it out of the way. Sometimes that drive home makes me talk myself out of it... especially running. My husband, also a teacher - always runs right after school. He knows he will skip it if he doesn't! Yes, it's definitely nice to be able to work out in my classroom and just get it DONE. We have to wait to run, though, because it's so hot when school ends. We usually putter around for a few hours and go run after 6. I was thinking your arms looked very defined before you even mentioned it! I'm glad you're in a groove with your speed and strength and are feeling good! :) So I cheat, my running rest days are upper body lifting days BUT when I start training for Via (May 9th!!!) I only get one rest day a week and it is going to be COMPLETE REST. Yessss, I'm so glad it's showing to other people, too, and not just to me! Today I did planks and my arms hurt SO badly I was like, But I thought they were getting stronger?! You look fantastic! On my rest days I do complete rest now. Usually Netflix helps lol. Netflix is a good way to enforce rest! It is so nice to have a buddy to go run and walk with. I have one run buddy, but we have very different schedules, so we rarely see each other. It makes such a difference to have a friend to call. I use to love to do walks on rest days! Right now, I am recovering from injury so I really limit my on feet time, I miss walking. A walk is a good way to unwind after work. Ha, yeah we always called it a "deck" up north but lanais are special because they're screened in, I guess? It's a definite perk of living in the tropics. Since I always have to walk Lola, rest days tend to be active recovery days. Lately there's been a lot more resting than normal as I'm trying to get to my race healthy! Having a dog is a great way to kind of force exercise daily. There are some days on weekends that I don't even get out in to the fresh air! Great week! I love the outfit you're wearing for your planks. I never get a day completely off from exercise because I teach yoga of some sort of fitness almost every day. Honestly, I can't remember the last time I took a real rest day. Depending on the kind of yoga, it can be a rest (or at least a recovery) day to me. It's all about balance and stretching and being mindful, so it's not as hard on your body. Great job Ali...I love seeing the results of hard work! Keep it up!!! Me too! Usually I can't really see them, but I was surprised to notice them this week. It made me feel really good! So awesome that you're seeing such great benefits from your current routine! 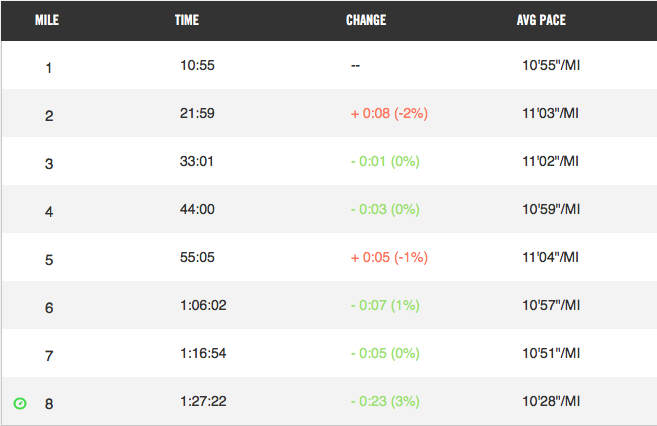 Awesome splits for your intervals! I can see how having an accountability partner would help.